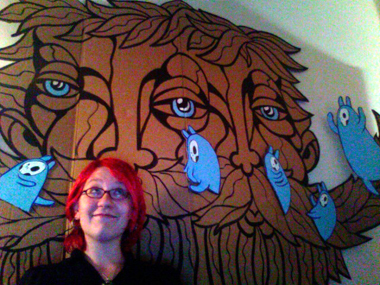 A couple weeks ago, fellow Kalamazoo guerrilla artist Bonus Saves and I, collaborated on our largest cardboard painting to date. 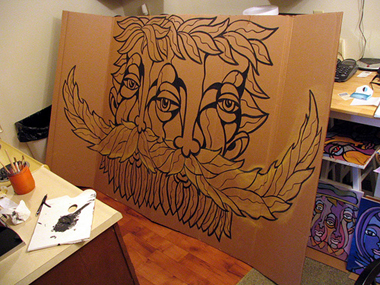 The cardboard painting measures conservatively 4 foot by 8 foot. I painted the large two faced character and Bonus incorporated his blue characters. 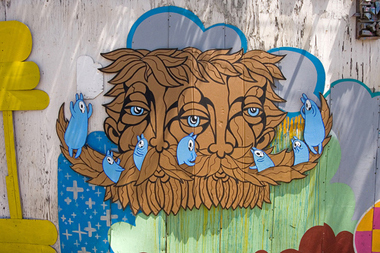 Bonus is very active in the Chicago street art scene so he took this piece during one of his visits. As with all our art it's free for the taking. On this rare occasion the finder contacted Bonus with a photo of her new found art. In the world of guerrilla art having the finder make contact with the artist is pretty rare. sammo: this is so great!!! how cool that the lucky recipient chose to let you know how much she loves the piece!!! That is a really cool piece. Reminds me a bit of the Green Manalishi images I've seen. You are certainly "Green" here since you are re-using material here.